If they ask any home builder, Portland residents will learn that it’s often the smaller tasks that help keep a property in great shape. Getting a jump on home maintenance in the spring also allows homeowners to fix problems while they’re still minor and inexpensive, regardless of the home’s age. Below, Portland home builders H. Hudson Homes provide 10 tips for keeping your home in shape. Inspect your roof. Things like a loose shingle from winter wind, mildew and moss growth can cause expensive water damage and compromise the integrity of your roof. Now is the time to inspect, clean and repair. Clean and inspect the gutters. Clear the leaves and debris from your gutters to prepare them for the spring rains in order to prevent water damage to your home. 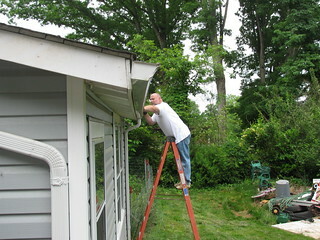 As you clean, fix gutters that are loose, leaky or don’t drain in the right direction. Repair sidewalks, walkways and the driveway. Fix cracks in asphalt and concrete before they get worse and pose a safety risk. Seal the cracks. Fill cracks in the exterior and interior walls of your home, window frames and door frames to keep your energy bills low and insects out. Clear the area around your HVAC unit. An outdoor HVAC unit needs good airflow. Removing plants, weeds, objects and debris that surround it will increase its efficiency and lifespan. Inspect the HVAC unit. Hire a professional to clean, inspect and, if necessary, fix your HVAC unit before the busy summer season starts. Pressure-wash the exterior. Beautify your property by pressure washing the deck, sidewalk, driveway, siding, fences, garage floor and outdoor furniture to get rid of stains, mold, moss and accumulated dirt. Inspect the deck. Replace areas of the deck where the wood has dry rot or is damaged, tighten the hardware (i.e., screws and bolts) underneath and fix unstable elements, such as loose boards on stairs. Clean and inspect the chimney. Hire a chimney sweep in the spring to maximize the efficiency of your home and prepare your fireplace and chimney for next fall. Clean the dryer vent. The vent has lint that the dryer’s trap didn’t catch. Clean it out to increase the appliance’s safety and efficiency. Some of the greatest advantages of regular home maintenance are the energy savings and health benefits. H. Hudson Homes is committed to offering sustainable home designs and construction that conserve natural resource, promote energy efficiency and improve the quality of indoor air. Learn more about H. Hudson Homes’ green building practices.